Bring a large pot of salted water to a boil. Add the asparagus and broccolini to the pot; boil for 3 minutes. In the meantime, heat a tablespoon of olive oil in a large sauté pan over medium-high. 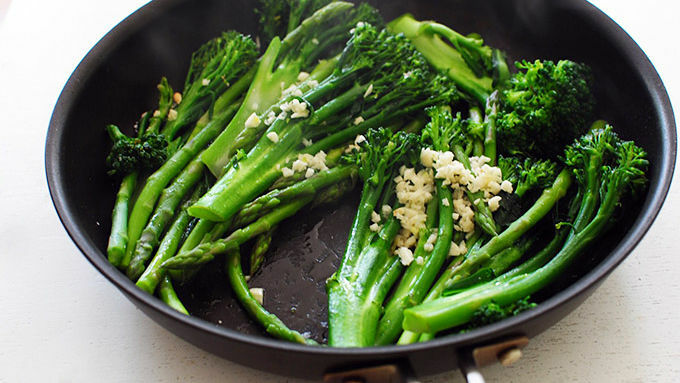 Using tongs, transfer the asparagus and broccolini to the pan; sauté for two minutes. Add the garlic and a tablespoon of lemon juice and sauté 30 more seconds. Season with salt. Transfer the veggies to a large serving platter. Cool slightly, then top with blueberries, toasted panko, lemon zest, parmesan shavings, a drizzle of olive oil, and a grind of black pepper. Give one more lemon spritz to the whole thing and serve immediately. 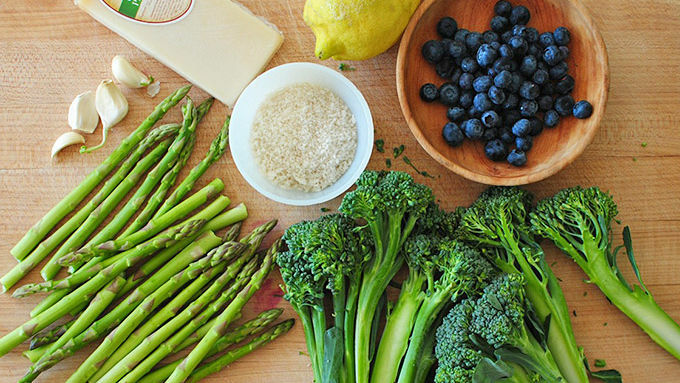 Broccolini is a hybrid of broccoli and Chinese kale, also sometimes called broccolette, which is smaller and thinner than broccoli. You can find it near broccoli in the produce section. 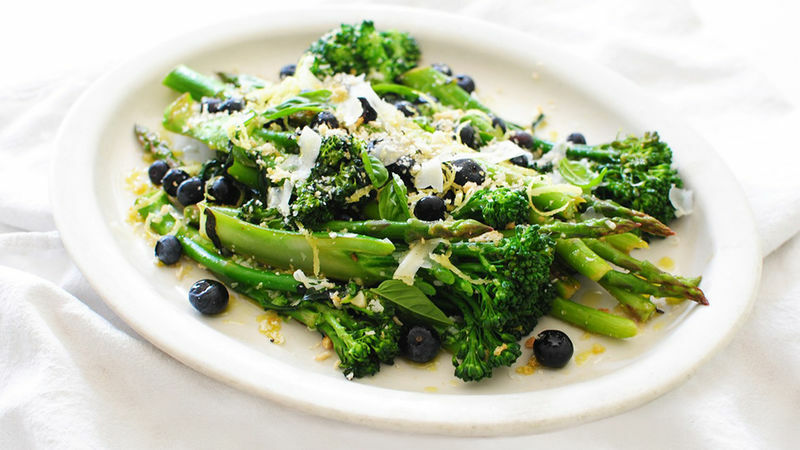 Asparagus, broccolini, blueberries and lemon zest. SUMMER. Blueberries and vegetables? Yeah, baby. This idea may take a moment to get used to, but once you wrap your head around it, you'll wrap your face around it. Plus, it's so pretty and summery and greeeeen your body will just GLOW. Sort of. Not really. Not like a glow worm. But you'll glow within. Anyway, blueberries on sautéed veggies! I promise promise it's amazing. The blueberries warm juuuust slightly, after sitting atop a mountain of health. It's lemony, has some good crunch with toasted panko, and a nice salty finish with Parmesan shavings. Good Lordy Lou, this is summer. Let's make it! It's super super simple, too.